The bending finger illusion trick is a great example of the saying ‘less is more’. Sometimes just a glimpse of something is stronger than a longer look. There can be many reasons for this but the one that is critical today is that you will likely be caught out on the method to this finger illusion trick if you do it longer than is required. This same reason applies to large illusions used in stage magic shows as it does to compact illusions like this finger illusion trick. When you watch a flashy stage illusion there is a reason why they are flashy and fast moving; it detracts from the method becoming obvious over time. Luckily for this magic finger illusion trick, you only need your hands and a playing card. If you don’t have a playing card you can use a piece of cardboard. I have found that cutting up breakfast cereal boxes works well for this. You don’t even need to make precise cuts. Simply tearing the cardboard is enough to be able to create an impromptu illusion. If you are unsure of the dimensions of the cuts I have included a download sheet that shows the very same card I used in the video. You can copy that directly if you like. The finger illusion trick is a quick fun mini illusion that provides a visual break from your other magic tricks. Remember, don’t overdo it. Less is MORE. 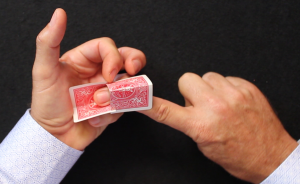 Did you enjoy this Finger Illusion Trick? To learn more easy magic tricks Click here!